79% of the participants have completed an academic education. 62% have an audio-related academic degree, which means that 17% of the participants are lateral entrants to the game audio industry and come originally from a different field and profession. 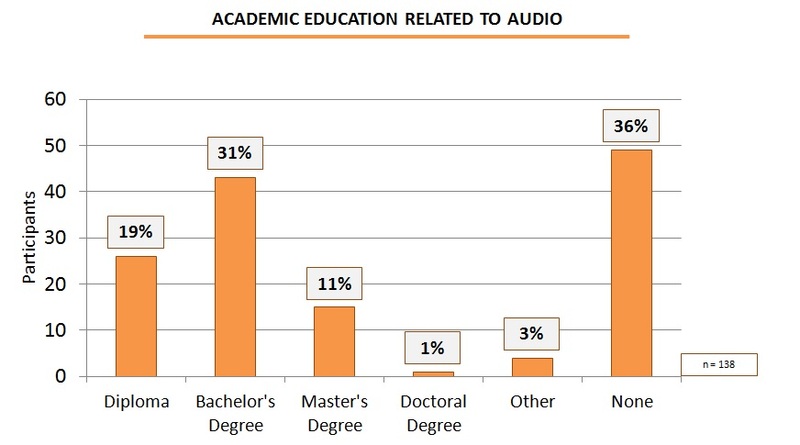 Many sound designers (78,8%) and composers (77,9%) have an academic degree. While these percentages are similar, 69,7% of sound designers have a degree related to audio, compared to only 45,5% of composers. 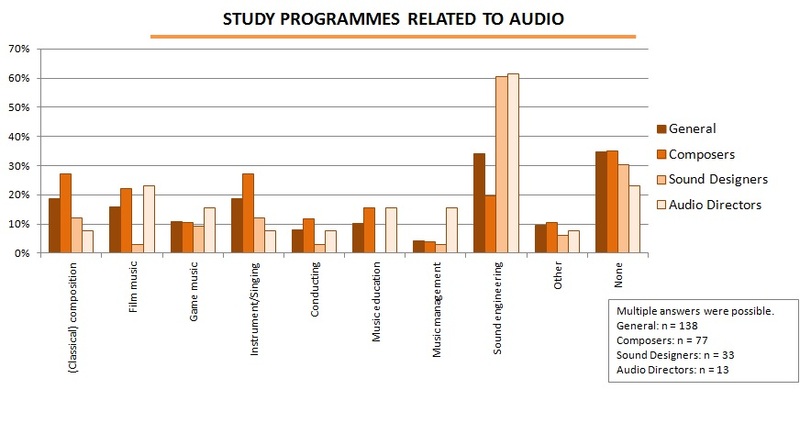 A big majority of sound designers (69,7%) and audio directors (84,6%) has an academic degree related to audio, whilst only 45,5% of the composers have finished an audio-related academic education. Although commonly not seen as essential requirement, especially for sound designers and audio directors an audio-related academic degree seems to be very usual and helpful, while composers often are not academically trained. Employees at a game studio or at a audio production company had an academic degree related to music/sound more often than freelancers. Among the study programmes related to audio, sound engineering is by far the most important one for sound designers and audio directors. Composers come from a variety of musical backgrounds. Game music is still very underrepresented in the curriculums. This study is the first in game audio research to evaluate not only academic degrees in general but also academic education related to audio in particular. The comparison of the two showed some significant differences. The professional industry experience of the participants ranged from 0 to 32 years. The average age of the participants in total was 33,5 years, which is quite similar to the average age of composers (33,3) and sound designers (32,4). With 35,7 years, audio directors are a little older. The average industry experience is 6,9 years for composers, 5,5 years for sound designers and 8,9 years for audio directors. On average, a professional career in game audio starts in the late twenties. For insights on visits of industry events, on job acquisition and on follow-up projects with previous clients, please request your free PDF copy of the full report now by contacting me directly via yannick[at]gameaudioindustry.com.